another. Please ignore the illegibility of textfields on Solaris. That's not a problem. This bug only happens on Win32. 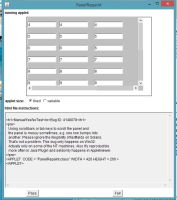 more often in Java Plugin and seldomly happens in Appletviewer.